Swede Peter Karlsson is set to skipper Wolverhampton Wolves in 2015 after agreeing to return to Monmore Green for the 10th time - at the age of 45. Karlsson, who lies second on the club's list of all-time record points scorers list, began his association with the West Midlands club in 1990. Since then he has had eight stays, the most recent last July when he suffered a poor second half of the season. He links up with Swedish compatriots Fredrik Lindgren and Jacob Thorssell. 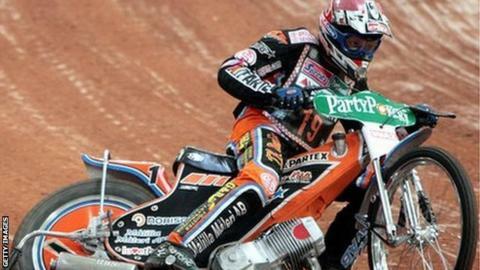 Polish youngster Tobiasz Musielak will take up the other place on the four-man Wolves team. "After much deliberation we've decided to offer the fourth place to Peter Karlsson, and he's accepted that offer," said Wolves promoter Chris Van Straaten. "He's been keen to stay with us ever since the curtain came down on the season in October. "He didn't want to finish with us on such a poor note after a tough season. But, having spoken to him at length, we believe last season was a one-off and he can get back to the level he was riding at before 2014. "The more we've looked at it we've realised that, up until that blip last season, he was a No 1 rider, and would ride through a brick wall for Wolverhampton." Karlsson, is considered one of the club's all-time greats, having now raced more than 500 times. A three-time World Cup winner with Sweden, he twice won the Elite League with Wolves in 2002 and 2009 before leaving in 2011. He spent three and half seasons with Lakeside prior to last season's return to Monmore Green.